GETTING A SIBERIAN DUE TO ALLERGIES IN YOUR FAMILY? Hypo– in the word: “hypoallergenic“ means “low” “less then” “below a certain level“. In medicine “hypo” refers to a deficiency; it simply means: “abnormally low levels” (for example: hypothyroid; hypoglycaemia.) 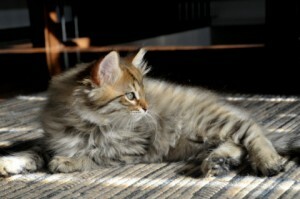 In referrence to a Siberian Cat, hypoalergenic means: “low allergen levels”. No pet is truly 100% allergen-free. Yes. The good news is, that when most people combine ownership of a Siberian cat with a well thought-out allergy prevention plan, the result may be no reaction, or milder reactions in allergy sufferers. 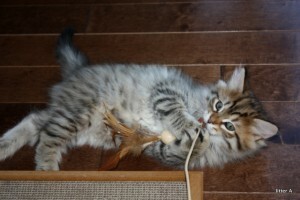 How about testing myself with a Siberian Cat prior to purchase? Testing does not provide conclusive evidence that you will never have a reaction to the kitten/cat you adopt. You may not react while testing with Siberians, but develop a reaction a year or two later. The opposite is also true: you may react to your new kitten, but the reaction may diminish as the kitten grows up. Allergy results vary a lot depending on the individual, the cat, the age of the cat, the time of year, and presence of other allergens. It is an issue that may change overtime (i.e. your sensitivity may increase). We bring these kittens into the world and feel 100% responsible for them. Our main goal is to find our kittens stable, permanent, secure, and loving homes. We want to avoid situations where, in a year or two, your family decides that the cat causes difficulties and needs to be re-homed. What does this mean for allergy-sufferers? If you suspect that you will most likely have a reaction that is unacceptable to you, then our Siberian Kitten is NOT the cat for you. We don’t want to risk the kitten’s chance for a stable home and lifelong happiness. If you have previously experienced mild reactions to cats and are looking to reduce the likelihood of reactions/or the severity of your reactions/ then a Siberian might be perfect for you. What separates Siberian cats from other cats is that they have LOW allergen levels, but no one should claim that Siberians have NO allergens. So if you are realistic about your expectations, hope for allergy reduction and have a solid allergy prevention plan (rather than expect complete allergen avoidance) then we would be happy to place a kitten with you. If your allergies are quite severe, we recommend testing the kitten (you are interested in) for its personal Fel d1 levels. The test costs US$350 for lab work, which would be 100% covered by the buyer. MORE QUESTIONS about Siberian Cats and allergies?